Incessant campaigning by finance companies, including door-to-door canvassing, has caused rising debt in the Northern Province amongst people who are only just emerging from a debilitating war, community leaders say. Newspapers are writing of suicides related to an inability to settle dues, although there has been no scientific research to connect these deaths with indebtedness. Several crop failures caused by drought have severely eroded farmer incomes, making it impossible for many to pay off loans. Ranjini Manivannan’s husband died in shelling on March 26, 2009, just weeks before the war’s end. She also lost two brothers to the conflict. She has a five-year-old son and ten-year-old daughter and earns Rs. 24,000 from a public sector job. A loan she has taken eats up Rs. 16,000 a month, leaving her with just Rs. 8,000 in hand. But Ranjini has built a house with the money and her steady income sets her apart from self-employed borrowers who are in dire straits. A World Food Programme (WFP) study titled ‘Food Insecurity in the Northern and Eastern Provinces of Sri Lanka’ states that the worst areas were the Jaffna, Mullaitivu and Trincomalee districts. It found that 63 to 75 percent of households had taken credit in 2012 and that 12 percent of household incomes went towards debt repayment. Egged on by the Central Bank, a slew of financial institutions—28 out of 48 registered companies—have set up offices in the North within the past three years. A few even have multiple branches and service centres, all vying for business in a small market. Kilinochchi is densely populated with finance companies in addition to the entire gamut of banks. They occupy prime, roadside property on either side of the A9. 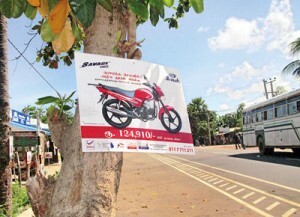 In the Mullaitivu district, some leasing companies have nailed their advertisements onto trees. These can be seen every few hundred yards, touting three-wheelers, tractors and motorcycles to farmers. The race to grab a slice of the pie is still very much on. And it wasn’t a large pie to begin with. “The population is very low in Vavuniya and Kilinochchi,” said the manager of a finance company with numerous branches in the North. 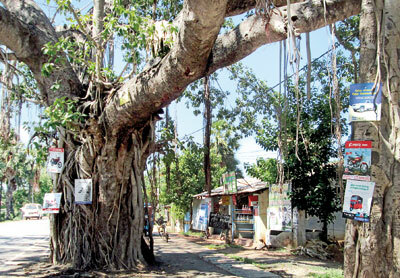 “In Kilinochchi, there are only about 130,000 people. Of this, the population in the 18-60 age groups is about 60,000.” This is the target market for all financial institutions in the area, including banks. Finance companies maintain that it is unfair to paint them as sharks. They don’t create the requirement, said Shammi Jayathilake, Deputy General Manager (Marketing and Product Development) of Commercial Credit and Finance PLC. They cater to it. But community leaders say this isn’t always the case. They point out that the Northern population has just emerged from a war that separated them from the rest of the country and, to a large extent, the open market economy. Dr. Sarvananthan believes that that the market will correct itself after a period of pain that might involve some suicides and even institutional collapses. “People will realise that they cannot go on like this,” he said. Many finance companies are aware of the high levels of debt in the North and East. One manager, who requested anonymity, said that the phenomenon of multiple loan-taking (mostly microfinance) has been brought to the notice of the Central Bank. He said it was especially bad in the Eastern Province where many borrowers were “invariably in a debt trap”. But he admitted that further research must be done to determine whether certain suicides were directly linked to debt. He also said that the industry had been expecting new markets to open up in the North after 30 years of war, “The reality is that many people are either elderly or quite young”. “Those who can earn a living or get a job abroad have left the areas,” he said. Another controversy over coal shipment: Why from Russian port? Do you see anything ‘common’ among these gentlemen and lady? Sustainable Development thro’ Innovations: 3rd International Conference held at Eastern Uni.